I’m sure many of you have noticed at this point that I like to start my reviews with a sensationalist introduction that usually involves non-musical descriptors most likely related to where my brain Wanders off to when I hear the band in question. This time the band has gone ahead and done that for me. Roll the clip! And there you have it. 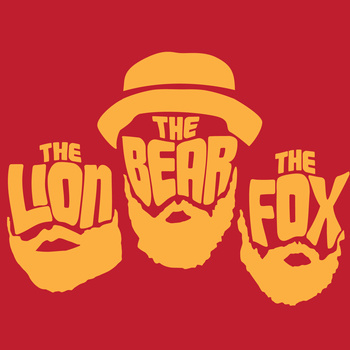 So now that we know we are dealing with a trio of lunatics who seem to be going through some kind of identity crisis, let’s talk about The Lion The Bear The Fox and their debut EP, We’d Be Good Men. I have been listening to a lot of debut EPs these days, and in most cases, the EPs are an introduction that showcases a handful of songs in whatever that band’s primary style happens to be. The result of bands who are just trying to get something out there to generate a bit of hype are EPs that can be quite excellent, but tend to lack diversity. We’d Be Good Men caught my attention because it feels like a [insert brewery name] variety pack. You’ll get a taste of each different style, but not too much of anything in particular. In this auditory sampler, we get a bit of blues, a bit of folk, a bit of power, a bit of sentimentality, and a bit of vocals from all three members of the band. Many debut EPs also show a certain degree of amateurism. The characteristics of a band that is still testing out its legs tend to come through their first recordings. This group of Vancouverites (Vancouvans? Vancouverans? Vancouvers?) sound anything but amateur. Christopher Arruda, Cory Woodward, and Ryan McMahon have all had solo careers of their own, and their experience shows in their first collaborative release. The trio plays with an immense acoustic energy, bringing the listener back to their roots while still bringing something new to the table. The most noticeable characteristic of their music is certainly their voices. Alternating between leads and backups, all three are able to bring hard-hitting power to their lyrics, create precise harmonies, or fit in with a nice countermelody. So whether it be a foot-stomping blues, a jaunty folk tune, or a dramatic ballad, at least one member of the band will have the right voice for it. The Lion The Bear The Fox have given us quite a bit to look forward to with the release of We’d Be Good Men. The amount of depth and variety on this EP definitely makes me think this band will have a lot to offer in the future. While we wait for the eventual announcement of a full length, you can stream the EP on their bandcamp page. ← Band Tee Mercredi Contest Winner!!! What made you hate it so much Erin? This was fantastic. Erin is clearly on her period.